Looking forward to some shopping to overcome the food coma? Black Friday and Cyber Monday are here and so are the travel offers! Here’s a compilation of Black Friday & Cyber Monday offers that we’ve heard of. We will update this post if we hear of more! IHG Rewards Club’s Kimpton brand has launched their Black Friday, Cyber Monday & Giving Tuesday 25% to 40% off promotion for stays through March 31, 2019. These are already available for bookings. The offers are available at participating hotels usually 7 days a week or Sunday to Thursday (check the list here). Kimpton also donates $5 per night consumed under this offer to their charitable partners. For more information about this offer access here. Hilton Waikoloa Village in Hawaii has launched their 2018 Cyber Sale that covers both Black Friday and Cyber Monday. Hilton Honors members can save 30% off their stays through November 30, 2019 if booked by November 30 this year. You can access this offer on hotel’s website here. Shangri-La has launched their Cyber Sale that is valid from Black Friday to Cyber Monday and for stays at select hotels in the Middle East and India Subcontinent. Golden Circle members that book under this offer can get 50% of their room rate back in F&B or Spa credit to be used during their stay that must take place May 1 – September 30, 2019. You can access this offer on Shangri-La’s website here. Radisson Rewards has now launched their Cyber Week special that is available for bookings through Black Friday and Cyber Monday until November 27, 2018. Members can save 30% off their weekend stays in Europe, Middle East and Africa through August 31, 2019. Expedia sent us updated information about their Black Friday and Cyber Monday offers for 2018 that you can find here. There are coupon deals from 75% off to $500 off $1,000 on Friday and 90% off on Monday starting sharply at 9AM PT (noon Eastern). You can access Expedia’s page for Black Friday and Cyber Monday deals here. You can purchase up to 150,000 LifeMiles every calendar year before any bonuses. You can always buy more miles during the redemption process by substituting some miles for cash. Avianca LifeMiles has launched a new promotional sale covering both Black Friday and Cyber Monday that comes with 140% bonus for all purchases made between November 20 – 26, 2018. 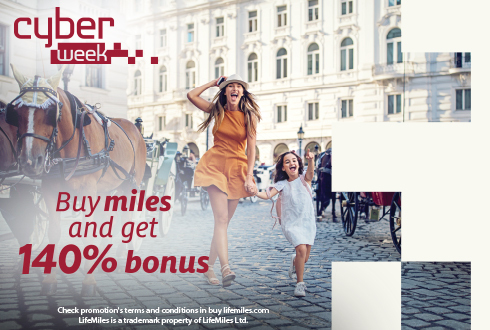 You can access this offer on Avianca’s LifeMiles website here. IHG Rewards Club has now enabled their Cyber Week offers page that are valid through Black Friday and Cyber Monday, although most of them won’t be available before November 23. Members can save minimum of 25% off their stays at participating hotels worldwide, earn 10,000 bonus points for Ambassador member sign up, 15% savings on Points & Cash and get 50% bonus on Bonus Points Package bookings. Le Club AccorHotels has now launched their Black Friday and Cyber Monday Sale that is 40% off of Best Flexible Rate at participating hotels worldwide. Accor Plus members are eligible for an additional 10% off for stays in Asia-Pacific.The offer is valid for stays January 1 – February 24, 2019 (in the UK until February 28) and must be booked by November 26. Hilton Hawaiian Village has launched their Black Friday & Cyber Monday offer for stays through June 30, 2019.Members that book this offer by November 26, 2018 can save up to 25% off their stays. You can access this offer in Hilton’s website here. Cathay Pacific has announced their very own Black Friday sale publishing a discount code for Business & Premium Economy Class ticket valid for the one week following Thanksgiving.Enter the promo code HOLIDAY to receive $1,000 off Business Class fares and $500 off Premium Economy Class from U.S. departure points when booking until 27 November, 2018. You can access Cathay’s website for the Black Friday promotion here. Qatar Airways Privilege Club has launched their Black Friday & Cyber Monday offer that is valid for bookings made between November 22 – 27, 2018 and flown by July 31, 2019.Privilege Club members will earn triple miles for Economy Class bookings and quadruple for Premium Cabins (Business & First). You need to register for this offer. Priority Pass has launched their Black Friday offer that is 25% to 40% off paid memberships until November 25, 2018. Priority Pass allows members to access more than 1,200 lounges worldwide and now also dine at number of airport restaurants. Aegean Miles+Bonus has launched excellent Black Friday buy miles campaign at 100% bonus that is valid only for three days only through November 24, 2018. Members that have credited at least one flight to Miles+Bonus can purchase 50,000 miles (before bonus) and others 30,000 miles. You can access this offer on Aegean’s website here. Not yet a TAP Miles&Go Client? Book your trip with Miles&Go Promo and get double discount on all TAP routes and triple discount on some routes to Brazil, Scandinavia, Spain, France and Eastern Europe. Sign up here if you are not yet a TAP Miles&Go client and get 1000 miles to start travelling with a discount. Alredy a TAP Miles&Go client? Already a TAP Miles&go member? During this promotion you can exhange 200 miles for €30, €42 or €60 or €20, €28 or €40 (depending on route) off the price of a return flight. A discount that can increase depending on your TAP Miles&Go account balance. Find out all you need to know about Miles&Go Promo and see how much you can save if you book by 27 November. Plenty of offers to take advantage of! We will update this post if we know about more travel offers so stay tuned!